A history of the Carillon & Grenville Railway, Canada's last broad-gauge railway. Also covered is the subsequent re-use of part of the right of way by the Canadian Northern Railway and its abandonment under Canadian National Railways. Some of my photographs of railroading in Canada and abroad. Photos of the Royal Canadian Pacific business-car train in Montreal in late November 2000. Photos of Canadian Pacific 2816's spring 2004 visit to Montreal. VIA Rail Canada only ever owned one "road switcher" type locomotive. It was No. 8558, an ex-Canadian Pacific RS-10. 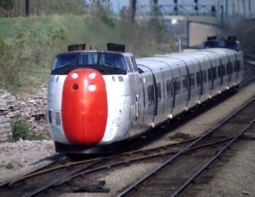 Its seen here in action in the late 1970s operating in its customary position on VIA as a trailing unit.